* Ever wonder how to make kummelweck rolls? * Just what is loganberry? * How do you inject your homemade sausage with "personality?" * What is the secret to delicious, authentic Buffalo Chicken Wings? If you have lived in (or visited) Western New York, inevitably you have asked yourself such questions. Buffalo has hatched more than its fair share of unique culinary ideas. And no one has had a better handle on local kitchen customs than Janice Okun, who served as food editor at The Buffalo News for over 40 years and remains the paper's principal restaurant reviewer. It's not surprising, then, that Okun's Buffalo Cooks is as original as the recipes within. Okun serves up each of the book's unique recipes with colorful, anecdotal side dishes: She chats with famous chefs, a former vice president who cooks on his fishing trips, and a woman who makes and serves over 400 buckwheat pancakes an hour. She tracks the origins of today's locavore movement and offers helpful hints (yes, you can freeze tomatoes if you take one simple step; no, you can't cook a turkey in a brown paper bag). 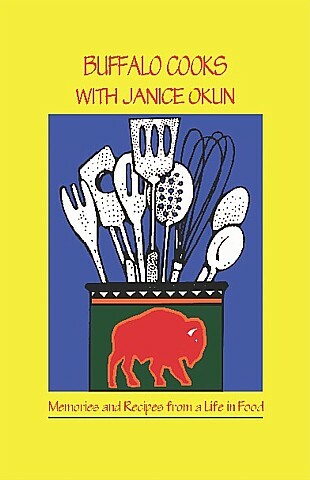 Buffalo Cooks with Janice Okun even highlights the culinary side of Western New York's glorious seasons and holidays. Whether you're wondering how to make delectable jams or why Buffalo Clam Chowder is the ideal large-gathering meal, you'll find the answers here. You'll also find more than 100 recipes that will delight family and friends for years to come.